The energy in the air is palpable and the joy is shared by everybody. Submersed in a sea of near naked bodies of every shape and kind and every expression of love. Relentless waves of glitter, boa feathers pound my senses as the groups rehearse their numbers before the final curtain call adding to the carnival atmosphere. 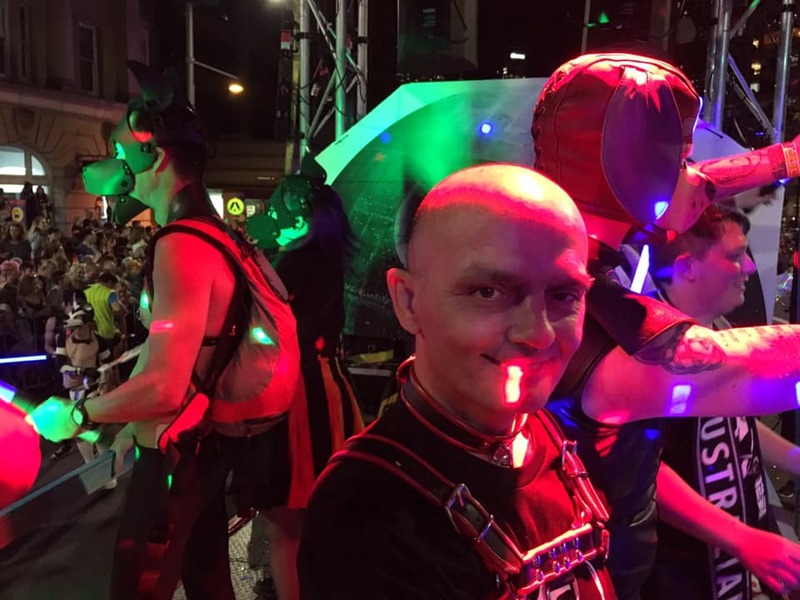 People’s creativity was on full-show five hours in the marshalling area…I could not be anywhere else but the 2019 Mardi Gras. Three-minutes to go. The sounds and the smell of the engines from the Dikes on Bike roar to life. The crowds were electric. It was not lost on me that some nineteen years ago I was a dancing cardinal, marching beside a gigantic George Pell head on the lead float of the 2000 Mardi Gras and now almost twenty-years later here I am dancing on a float surrounded by pups whilst the big head is now in gaol. That must be some sort of full circle. Pups rule! My beam from my light sabre cuts through the night. The float looked amazing. The crowd ate us up like a big tin of Pal. A lot of hard work had gone into presenting such a fantastic float but in a galaxy not very far away a puppy fell sick, collapsing on the back of the truck. As I discarded my light sabre and the ladder strewn upon them, over the top of loud star war themed music I screamed for help. “Don’t worry, Just keep dancing” was the response I heard back.” “The show must go on!” I look up through the strobe lights and the fogs to see a silhouetted array of Jedi Pups armed dancing out of step with light sabres. Pups, you are PAWSOME! Thank you Q-PAH for both the invitation, and for your friendship. Also, thank you to Bootco for the opportunity to represent the club.